Details of call reporting spotting of Nashat Milhem boarding a bus published, showing police declined to check information. Throwing further light on the alleged police mishandling of the Tel Aviv shooting attack on January 1, the recording of a call reporting that the terrorist was spotted just hours after the attack was released on Sunday. The call was made by Guy Kokush, the owner of a restaurant in Kiryat Tivon near Haifa, after two of his workers spotted Arab Israeli terrorist Nashat Milhem getting on a bus in northern Tel Aviv just hours after the attack as he fled to his hometown of Arara in the north. Milhem had murdered three people in Tel Aviv. The two workers, who were sisters, recognized him from TV broadcasts later that afternoon after having seen him board the bus earlier in the day. They saw bloodstains on his shirt and backpack and alerted the driver, who told them the man would probably get off the bus soon. The recording of the call apparently shows the major snafu that, if it hadn't been made, may possibly have allowed police to track down Milhem quicker than the full week it took them as he continued to pose a danger to the public. "A worker of mine suspects that she saw the murderer get on a bus and we reported on it from Kiryat Tivon," Kokush can be heard saying in the call to the police hotline. He went on to explain to the police receptionist that he had already called and passed along the report, and that he was waiting for someone to call him back and follow up. In response the receptionist asked him to hold, and then came on again to say: "can you tell me exactly what happened and what she saw?" "She saw him (Milhem) in Tel Aviv get on bus line 826," responded Kokush, indicating a line that travels all the way to Nazareth Illit in the north. Shockingly, the receptionist then told Kokush to call the police information center himself, instead of herself dealing with the report that was not followed up on until after Milhem was killed in a shoot out a week later. "Okay, so call 110 to the police information center and there they will check for you," she said. "If you guys are interested then you call, I gave the report, it's important to me to help you," responded the surprised restaurant owner. She answered: "okay, that's what they told me to tell you." Kokush replied, "then it's very serious that this is the way you guys treat this." 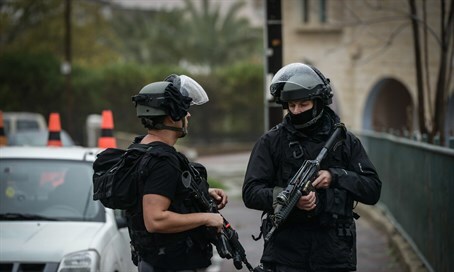 In response to the publication of the recording, the police issued a statement saying: "the Israel police are currently conducting an operational investigation into the incident in Tel Aviv. At its end and presentation to the various sources, if there are lessons - we will investigate, learn the lessons and update the public."